For the longest time, I have sworn that I would never become a Mac person or an iPerson. My previous experiences with Apple products were full of scratching my head for hours trying to figure out how to do the simplest of tasks. However, when my third Android phone began experiencing elderly issues, such as a highly inaccurate battery indicator, my curiosity gave in and I decided to go for an iPhone 6. I had no idea what I was getting myself into. Luckily for me, a very patient sales representative offered to spend over an hour setting up my iPhone and teaching me how to use it. After my training session, I mastered the art of turning my iPhone on, and it was time to celebrate my epic achievement with some sushi. 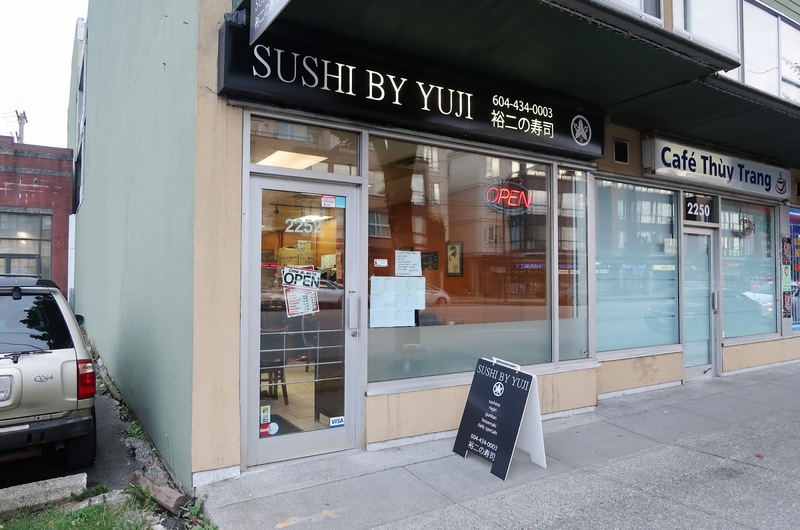 Sushi by Yuji is a small authentic sushi restaurant that has garnered the attention and acclaim of many of Vancouver's food bloggers due to its finely executed nigiri sushi. The prices were actually not as high as I was expecting, but the ambience is very informal, and the restaurant does not look like much more than a take-out place. 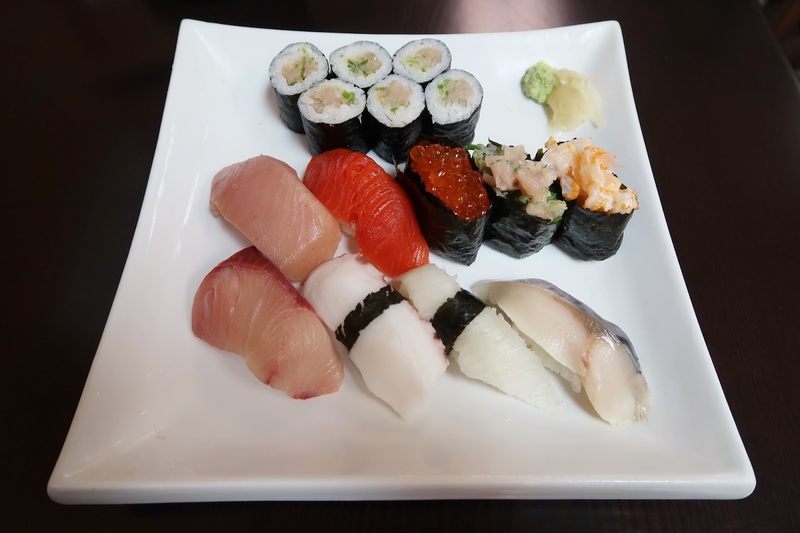 As Sushi by Yuji focuses mainly on sushi, the menu is not extensive, and there is no tempura. 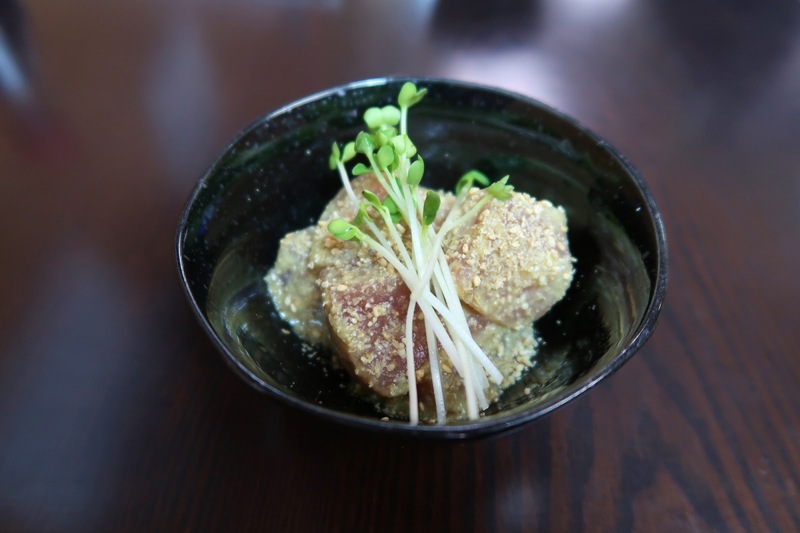 The first dish to arrive was the Marinated Tuna, a small appetizer consisting of marinated small cubes of tuna, wasabi, sesame, and daikon. The smell of sesame was quite strong here, and the tuna had an excellent melty and soft texture. However, I didn't exactly expect the tuna to be almost wholly marinated with wasabi. With each bite, it felt like a missile was being shot up my nose. By the time I finished all of the tuna, my nose felt very... umm... mesmerizingly tranquilized. Next, I had the Deluxe Assorted Sushi, their most extensive nigiri sushi combo. The nigiri was neatly presented, which prompted me to take out my phone and send a picture of it to my friends. At the same time, my next dish, the Tanuki Udon, also arrived. I wish they had given me a bigger table, because with two large dishes, my Canon G7x camera, my phone, my notebook and various eating utensils all sprawled out on my table, my hands were flailing about trying to grab the right things. I literally looked like I was doing the starfish in my seat. 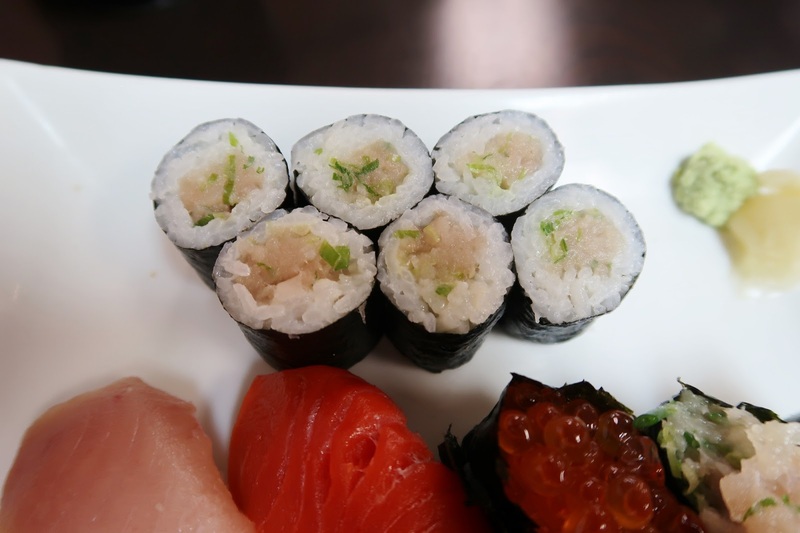 The Negitoro Roll was well-constructed with melty tuna, and the seaweed was remarkably easy to chew. A few pieces felt slightly rice-heavy, but in the other pieces, the rice structure was good. Overall, the nigiri came with very generous cuts and was a rather good deal at only $19.50. The tuna had a wonderfully melty texture, and the sockeye salmon had a nice smoothness despite the slightly flawed cutting. The ikura (salmon roe) featured a rich flavour and a bubbly texture and went well with the sushi rice, which was not packed too tightly. The Negitoro Nigiri had a little too much green onion, so there was not much of a tuna flavour left in it. The chopped scallop was decent with a pleasant creamy, sweet flavour. Onto the bottom row, the hamachi also came in a rather huge cut and had a smooth texture, but it was slightly chewier than expected. The Tako Nigiri (octopus), however, was sliced thinly to avoid chewiness and had a well-balanced flavour. The Engawa Nigiri (halibut fin) had a nice bouncy chew to it, and its delicate, sweet flavour went well with a dip of soy sauce. Finally, the Saba Nigiri was fresh, smooth, and overall, an excellent finish to the Deluxe Assorted Sushi. For my filler, I ordered the Tanuki Udon, which came with bits of fried tempura batter, green onion, and ginger. This was simple and inexpensive ($7.75), but quite standard fare. 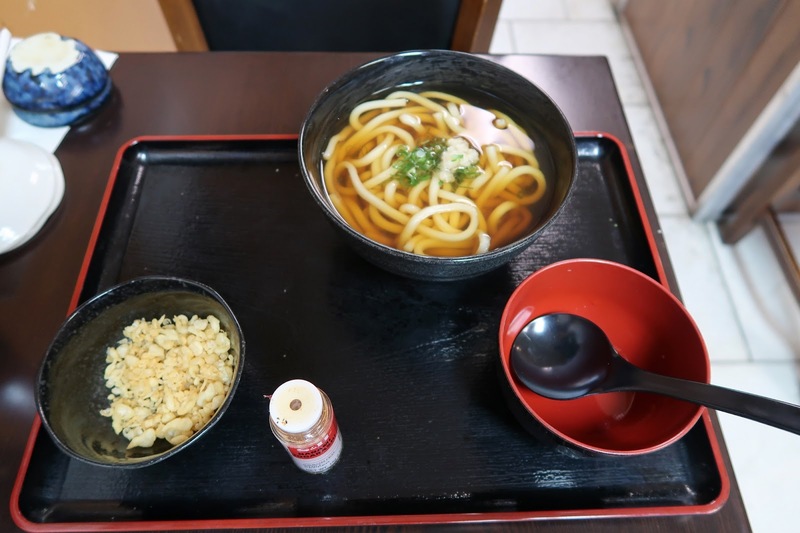 The flavour of the ginger on top thoroughly permeated the broth, which was the sole unique characteristic of this udon. One thing I liked about this udon was that the tempura batter crumbs were served on the side, or otherwise, who knows what it would have become in the 30+ minutes it took me to finish the Deluxe Assorted Sushi? 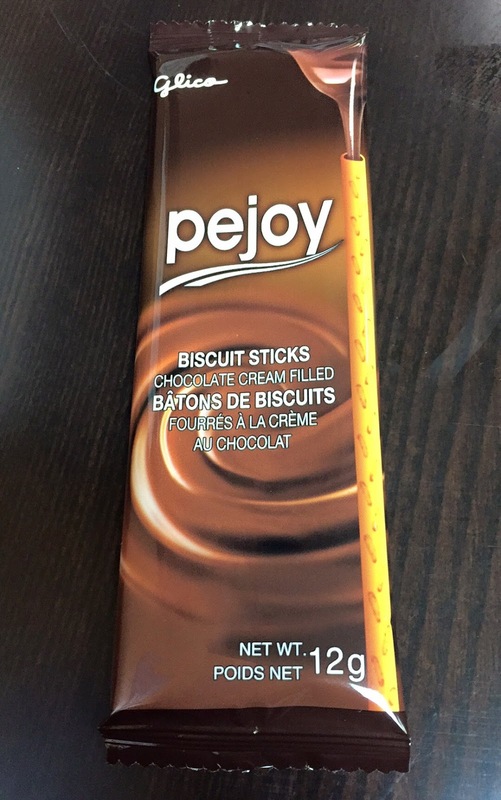 As soon as I paid my bill, I was rewarded with a packet of Pejoy biscuit sticks. According to Pejoy's website, Pejoy is Pocky's friend and is supposed to melt away your stresses for the day. Well, that's definitely worth paying the bill for!